24e classe. —Le chien courant (G. cursor). 25e — Le basset (C brevierikus tibis. 26e classe. — Le braque (C. sagax). 27e — Le braque de Bengale. 28e — L’épagneul (C. Hispanicus). 29e — Le petit épagneul (C. H. minor). 30e — Le barbet ou caniche. 31e — Le petit barbet. 32e — Le gredin (C. brevipilis). 34e — Le bichon (C. melitoeus). 36e — Le chien de Calabre. 37e — Le chien de Terre-Neuve (Canis aquoetilis). 38e classe. — Le terrier ou renardier. 39e •— Le chien d’Alicante. 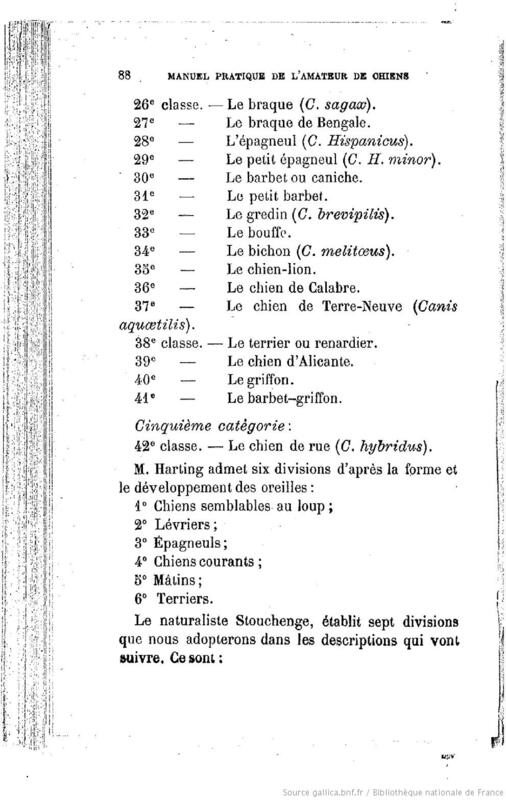 Categorization of breeds from 1907 by french author Larbalétrier, Albert. “Barbet” is used three different times as a part of breeds’ names. Barbet ou caniche (that is what we now call Poodle) was different breed than barbet-griffon, for which the standard was written and is now called simply – Barbet. Should give some explanation to doubts concerning the origins of the breed and its naming (Griffon of course).